Once upon a time, there was a range of lipsticks I loved. I loved them for many years, building my collection from the bottom up, loving the balmy texture, the moisturising feel and the wearable colours available. Then one day, they were reformulated and I lost my one true love. So I sat, and whined and pined for a lost love. But as lost loves go, I’ve found another, and my heart gave a little leap of joy. I can now start a brand new collection! It sure took Bobbi Brown a while to get onto the balmy lipstick trend (a few years late in fact), but boy did they come up with a stunner of a product! Like most balmy textured lipsticks, the texture of the lipstick in the bullet is a little soft, and I find that it melts a little on contact with skin. So, while it looks pristine fresh from the store, the minute you apply the first swipe, you will find the sharp edges breaking up and becoming blunt. It does not hold the shape as well as a more matte textured lipstick will. I’m used to this so I’m not fussed, but if you are particular then you might be. 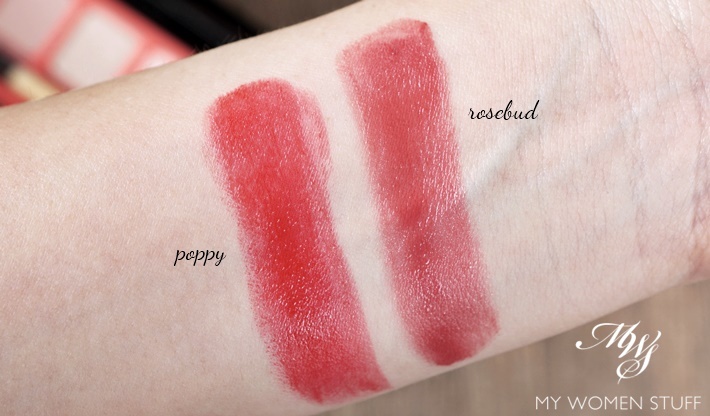 Swatched on my arm, you may notice also the slight transparency of the lip colour. This is quite typical of lipsticks in this category. 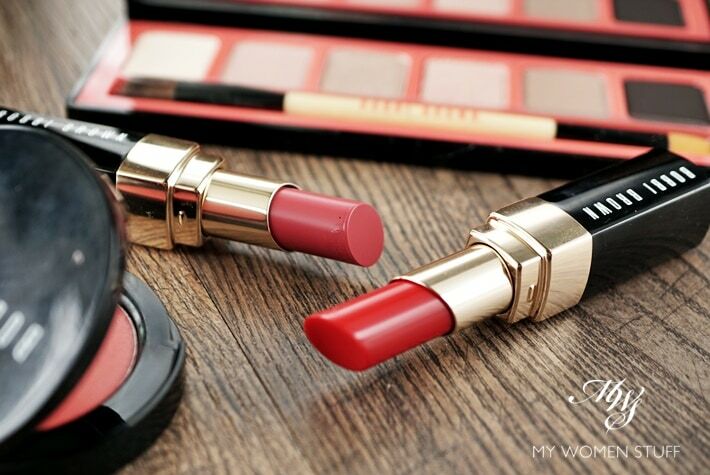 The more moisturising a lipstick is, the higher the chance of it being a little more sheer and vice versa. I find it quite easy to apply it with just 1 swipe on the lips, straight from the bullet. As I’ve mentioned, it seems to melt a little on contact with skin, so it glides over your lips very smoothly without tugging, and leaves a glossy colour behind. For an idea of how it looks in a full face, here’s Poppy and Rosebud. Just 1 swipe of lipstick straight from the bullet. The Bobbi Brown Nourishing Lip Color feels very lightweight on lips, and is, as the name implies, lovely and moisturising. I find the colours pigmented enough, yet offering that transparency that I love in lipsticks of this texture. It makes it a very easy lip colour to wear, and it makes your lips feel so good even after you remove it! Even when my lips feel a little dry, popping on these lip colours make them feel better after that. While most moisturising or balmy lipsticks tend to fade quickly, I have no problems with these. They seem to stay put (although they will mark cups and kiss off – so no kissing!) well enough, even after meals, if you’re careful. It’s quick and easy to touch up, and shiny lips always impart a youthful vibe. 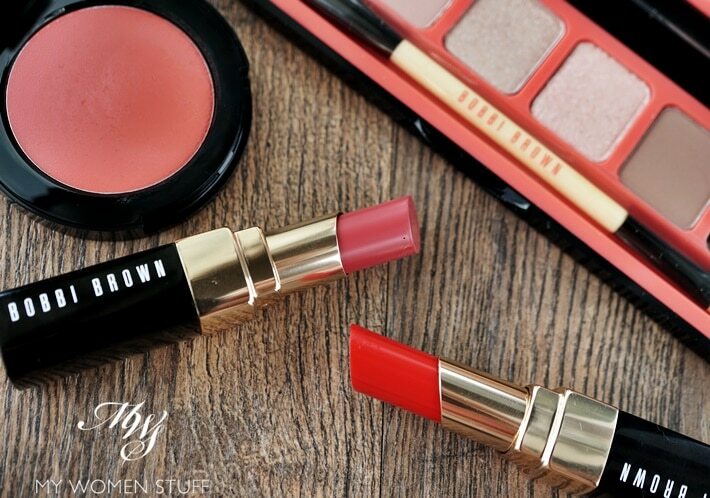 Have you tried these new Bobbi Brown Nourishing Lip Color lipsticks? Which other colour do I absolutely need? Disclosure: Featured product was a press gift. Our commitment is to honesty and fairness. For review guidelines please read the disclaimer. PREVIOUS POST: Affordable and effective, the Sukin Cream Cleanser ticks all the right boxes! Ooh, I’ll have to check out these while I have my mom try out the Luxe ones! They both look lovely but Rosebud definitely seems easier to wear. To be honest Hanna, I don’t quite like BB’s Creamy Lip Colour which I find drying on my lips. I do like the Luxe Lip Color which is intense and creamy and not drying for me. This one is infinitely more comfortable in terms of moisture, as it leaves lips feeling soft and moisturised. Based on my experience, I’d say this is far superior to Creamy Lip Colour – but you will have to realise also that the texture will be more slippery and may be a little sheerer in colour. I bought Rosebud several months ago and it is the only lipstick I’ve been wearing everyday. Good choice, Evie! Rosebud is the perfect everyday shade! I’ve been wearing mine regularly too! Ooh wear Poppy – it’s gorgeous! Blush sounds like a pretty colour – perfect for that my lips but better look I bet! Dear, must be your blog, rosebud lipstick out of stock ? Goodness, I’m shocked! LOL But I honestly doubt it’s me – maybe it’s a coincidence? 😀 I hope you get it soon though. It’s a lovely colour in a gorgeous formula! Heheee i got it finally, is very beautiful colour, thanks for recommending ??? That’s awesome to know! I love Rosebud too – still using it almost daily! Woman, you look too good in red! My skintone is more Southeast Asian tan, so I don’t look as good in reds – yay to you! I will be at Bobbi Brown counter tomorrow! =D I am already a fan of the standard Bobbi Brown lipsticks so I am more than happy to buy into another line from them. Can anyone speak as to the wear time of these particular lipsticks? I love the texture of the Luxe LSs, but they have NO staying power on me. On several blogs I read that people were getting 4-6, depending on the shades. It starts to fade as soon as I get it on & it’s not a pretty, even stain leftover. It’s quite a disappointment because I bought a bunch during the holidays last year. I absolutely love the Luxe colors, texture, etc. but those were expensive lippies & I’m not paying that much money based on my experiences. I’ve tried wearing light, medium & dark variations, with & without lipliners, powdering after application & reapplying but nothing makes them stay on my lips. Therefore. I was hoping I could get some insight into anyone & Paris’ experience with the longevity of these lipstcks. Thanks for the response Paris. I’m really upset that the Luxe formula doesn’t work for me, because the colors are really fabulous.